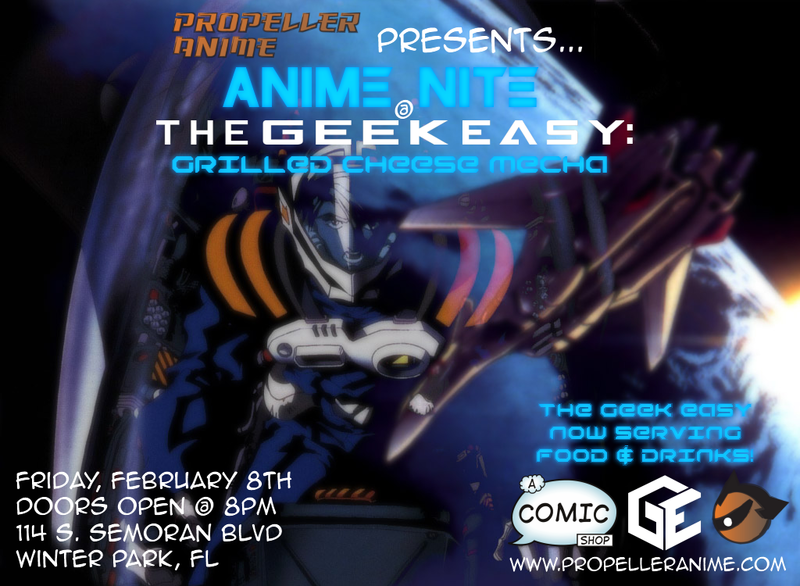 On our road to MegaCon in March, we'll be showcasing anime that will be featured in events that we be hosting throughout the convention weekend. 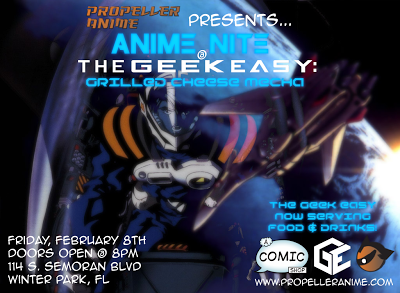 Our theme for this one will be an introduction into mecha anime for modern fans. This means we'll be showing very awesome mecha anime that doesn't require over 30 years of knowledge of the genre! This ain't your dad's copy of Robotech we're showing! 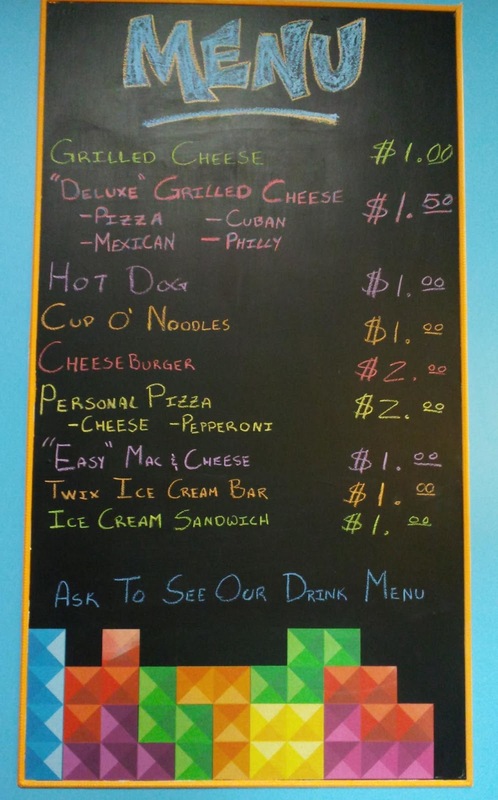 The Geek Easy Serves Food & Drinks Now! 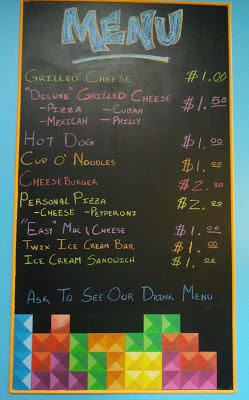 The Geek Easy now serves food and drinks! No word on beer and wine yet but that is in the works. In addition to what you see on the menu, The Geek Easy sells candy, BEEF JERKY, Ramune, and Pocky. Not a bad deal! This means that NO OUTSIDE FOOD OR DRINKS will be allowed. You will be kicked out if you bring any in. The other rule we are supposed to share is that nobody under the age of 16 is allowed into The Geek Easy. So what do we have to show on February 8th? Our main feature will be the Macross Plus film! If you are a fan or Cowboy Bebop, you should dig this because many of staff from that worked on Macross Plus, including director Shinichiro Watanabe, writer Keiko Nobumoto, and music composer Yoko Kanno. Macross creator Shoji Kawamori was on it! Pilots Isamu Dyson and Guld Bowman battle not only for air superiority for a military program, but also for the love of childhood friend, Myung Lone. Myung is a producer for an advanced A.I. music idol known as Sharon Apple. When an unstable and illegal A.I. technique is implanted into Sharon, control is lost and Sharon takes over Macross City, forcing Isamu and Guld to put aside their differences. But can they?! Our opening feature will be the very metal Mazinkaier SKL. From the crazy world of Go Nagai, is an OVA with violence, explosions, hot-bloodedness, chicks in togas, loads of testosterone, heavy metal music, and three factions battling for control of Machine Island. At the heart of the conflict are two Ikari Warrior-like mercenaries in Ken and Ryo, pilots of the Death Caprice Squad's Mazinkaiser SKL. Their mission: disable the unstable Gravity Curtain that surrounds Machine Island before it explodes and destroys all life on Earth! There you have it; TWO action-packed anime features to look forward to in February that have a lot of mecha lovin' going on. Plus there are all those grilled cheese sandwiches to feast on! See you on the 8th!